Hard to believe it’s been two weeks already. Our time in New Zealand is drawing to a close and Australia is up soon. Wish we could spend all three months traipsing around these gorgeous islands, but it’s World Trip 2017 not Kiwi Trip 2017. The day was spent driving from Dunedin to the Royal Albatross Center on the Ortega Peninsula. We could have paid $50 each for a tour into the heart of the wildlife reserve, but opted to peer at few of the giant birds and a handful of measly seals from afar and for free. 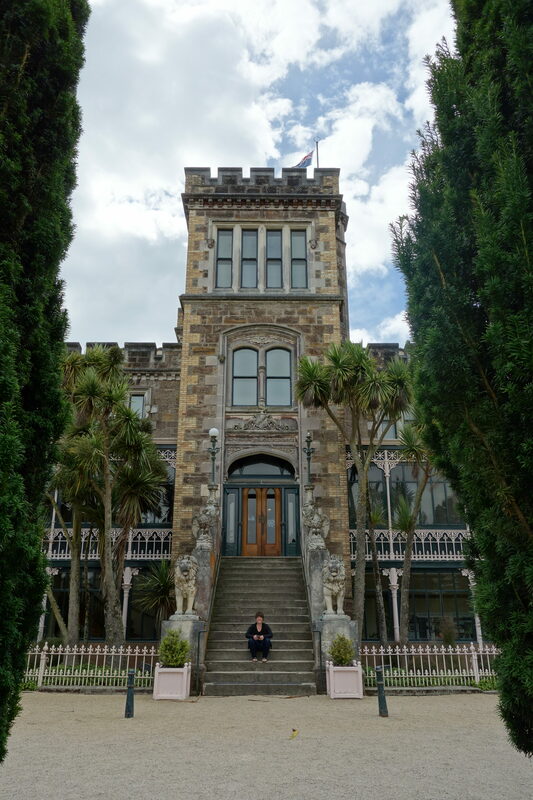 The highlight for me was a stop at Larnach Castle. Over the past fifty years, the once derelict and graffiti-covered ruin has been painstakingly renovated by the Barker family and restored to a semblance of its former glory. The complex story of the Lanarch family was peppered throughout the property. After a tumultuous life filled with both wild success and tragedy, Mr. Larnach blew his brains out with a revolver and, a few years later, his son followed suit. The Camp, as the castle was fondly called, was uninhabited until the Barkers stumbled upon Larnach during a tour of New Zealand very much like the one Tiffanie and I are undertaking. Thankfully, we haven’t bought a castle yet. We headed north toward Kaikoura, stopping to sleep at a beautiful wildlife reserve surrounded by rolling hills infested with sheep. Since we showed up right at dusk, we also had the joy of listening to the sheep being brought in from pasture. Hilarious noises. Highly recommend.